The 2005 National Collegiate Golf Championship (NCGC) is pleased to announce that 32 schools have been selected to host a local qualifying event for the 2005 program. A majority of the local qualifiers are open to surrounding schools and include three divisions; Students, Faculty/Staff and Alumni/Community in this two person scramble event. Winning participants qualify for the National Championship November 11-13 in Las Vegas, NV. For a list of participating schools or to find out how your school can become involved, please visit www.cgagolflinks.com/ncgc.asp This year's sponsors includ e: Southwest Airlines, Red Bull, Sports Illustrated On Campus, American Golf, Warrior Golf, almostGOLF American Hole �n One, CTV, and Cutter & Buck. The 2005 event is an officially endorsed NIRSA program and portions of the proceeds benefit the NIRSA Foundation. June, 2005- Collegiate Golf Alliance announced today that it is partnering with Red Bull for the 2005 National Collegiate Golf Championship. Red Bull is providing focus, concentration and a fun new competitive concept to the existing university golf tournaments, and the CGA is providing a great avenue for Red Bull to help support college golf and recreational sports throughout the US. 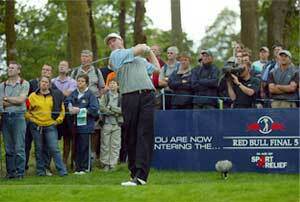 The Red Bull Final 5 is a competition which rewards the golfer with the best score over the final five holes. Drink a can of Red Bull on the 12th or 13th hole and help yourself focus and perform on the crucial final five holes. As part of Red Bull's involvement with the NCGC, selected schools will have the Red Bull Final 5 competition incorporated into their Local Qualifying Event. Winners of the Red Bull Final 5 will earn complementary entry and travel to the National Championship in Las Vegas. The Red Bull Final 5 is a competition which rewards the golfer with the best score over the final five holes, statistically where golfers tend to make mistakes due to physical and mental fatigue. Drink a can of Red Bull on the 12th or 13th hole to increase your focus and concentration for the crucial final five holes. The growth and success of the National Collegiate Golf Championship has lead to an increase in media coverage. Collegiate Golf Alliance is please to announce partnerships with print and video / internet media sponsors. Sports Illustrated on Campus - A publication solely dedicated to college athletics and the sports interests of college students has teamed with one of CGA partners, NIRSA, and will include coverage of the NCGC. The publication will be distributed at more than 150 major universities throughout the school year, generating a circulation of one million readers between the ages of 18 and 24. The 28-page publication is distributed at no cost to students 13 times each semester (26 times per school year), primarily every Thursday of each school week. CTV - Showcases the activities of the campus through video on large flat screen TV's in Recreation Centers and Student Activities buildings. CTV also presents the action clips via the internet. CGA is pleased to announce a media partnership with CTV's Live on Campus. As you may recall, CTV filmed and produced a short video for the national tournament last year, which can be seen at www.iwatchctv.com (select Collegiate Golf Alliance from the down list of campuses). To build on the success of this partnership and increase exposure for all of our local qualifiers and golf expos, we have developed a program which will allow each of you to film highlights from your events, with cameras provided by CTV, and then have you mail the finished footage to them to be professionally edited and produced. This footage can then freely viewed on the CTV site for everyone to see. This program will be done at no charge to any of the participating local qualifiers. 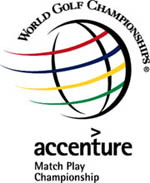 We sat down with Michael Garten, Executive Director of the Accenture Match Play Championship to find out a little about overseeing such a large tournament. We thought CGA members and tournament directors could learn from his experience the past seven years. Michael started his golf background at the University of Southern California assisting with the Trojan Golf Club and serving on several fundraising and charity golf tournament committees. Q: Tell us some of the big items you think are important for long term planning when organizing a big event like the Match Play Championship? With today's complex world and the demands of everyone's time, the term planning ahead has never meant more for a successful event. Americans have less leisure time and the amount of business entertaining is decreasing. In order to maximize participation and sponsorship you need an effective and timely marketing strategy to promote your event. Are you organizing or playing in any college or university golf tournaments? If so, then why not take advantage of a free service offered by the Collegiate Golf Alliance. On-line event posting increases your potential for your golf tournament and provides valuable information about your event for both sponsors and participants. Each tournament gets a dedicated web page that includes: tournament information, course descriptions, links to your tournament course and to your university. The added exposure through the CGA database of golfers is a tremendous benefit. When an event gets posted, all CGA members that identify with your university are sent an email alert about your event. With over 8,000 CGA members who have played in tournaments your event is given top exposure. Your Golf Tournament Director also has the option to use our advanced on-line registration and management tool, which assists with tournament registration, management, pairings, communications, and results. The amount of time your Tournament Director spends on the tournament is drastically reduced and the quality of the tournament increases for everyone involved with your event. For more information and an online tutorial go to www.cgagolflinks.com or email info@cgagolflinks.com . Southwest Airlines, the low-fare leader enters the third year as the official airline sponsor of the National Collegiate Golf Championship. Southwest Airline brings golfers of all abilities across the country to compete for their college or university in the National Collegiate Golf Championship. Southwest provides tickets for winning teams from local qualifiers to travel to Las Vegas for the National Championship. The CGA will also award 1 free SWA roundtrip ticket to Las Vegas for the National Championship to the two local tournament directors with the largest events that use CGA's online registration tool. �We are very excited to once again partner with Southwest Airlines to assist Colleges and Universities with travel to the National Championship. Southwest's support of the Golf Championship allows this tournament to reach across the country to crown a true National Champion�. What began as a small Texas airline has grown to become one of the largest airlines in America. Today, Southwest Airlines flies more than 65 million passengers a year to 60 great cities all across the country, and they do it more than 2,800 times a day. They are the only shorthaul, low-fare, high-frequency, point-to-point carrier in America. For more information go to www.southwest.com .